My much loved cat Cosmo died yesterday evening. Many thanks to all the staff at my vets for their compassion and excellent support at the end. He came home with me last night. 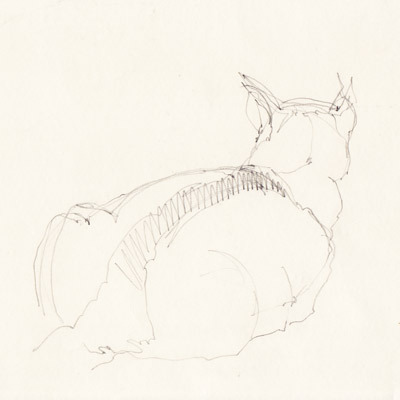 Last night and again this morning I drew him resting on a comfy cushion on the sofa - having his last catnap - before he went for his final trip to the vet prior to an individual cremation. 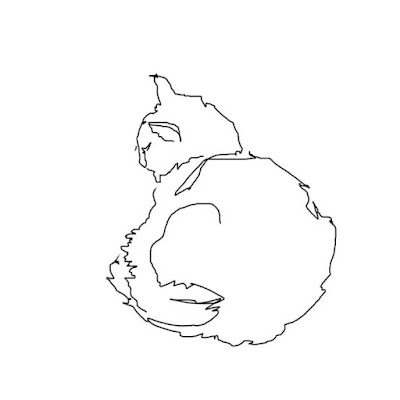 I've done this before and I highly recommend spending time with and drawing your pet after death - it really helps as part of the grieving process. Cosmo was born in August 2000 and died just a few weeks short of his 15th birthday. He was an absolutely gorgeous big Somali boy cat with the oddly named 'usual' colour fur. He also has such a lovely nature that I wouldn't hesitate to have another Somali in future - although there could never be another Cosmo! He's been a regular on this blog over the years. 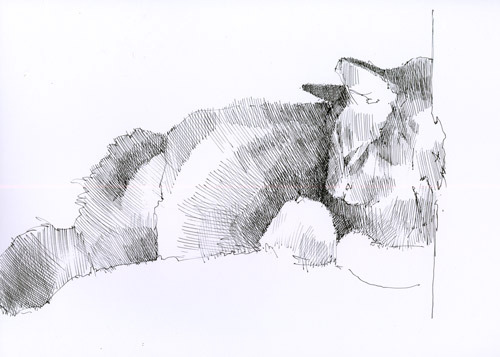 He featured in the fourth post on this blog Drawing and Flu and a series on catnapping starting in 2006.
and this post about How to make it easy for people to link to you - and how to sketch a cat! 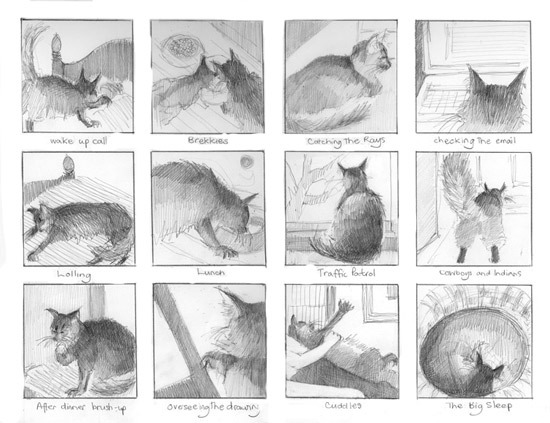 In 2008, I drew A Day in the Life of Cosmo. Looking back at it, his daily routine didn't change that much over the years - although there was a lot more "lolling" and "evening cuddles" and rather less athletic exercise, door climbing and "cowboys and indians". He's now on a permanent "big sleep". 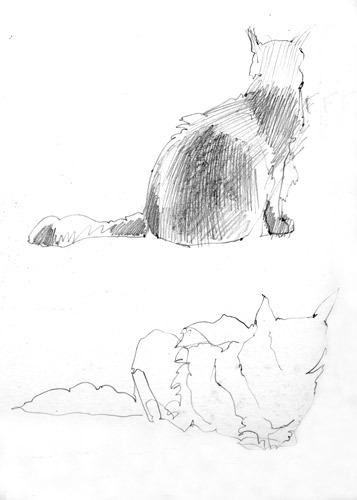 He had a spell as a model for my drawings that were exhibited at the annual exhibitions of the Society of Feline Artists. plus sketching media became digital in addition to pencil and pen and ink. drawn using Sketchbook Pro and a mouse! He's going to be much missed. I want to find him a really nice casket for his ashes. I'd be really grateful to hear of any artist who works with wood or metal who I could commission to incorporate a line drawing into a suitable secure casket in wood or metal. Very sorry for your loss! Beautiful artwork tribute to him. I know this pain all too well, having had to have a beloved cockatiel put to sleep this year. Worst day ever. Such a beautifully recorded post Katherine and a celebration of a much loved companion. I wish you all my sympathy and best wishes. I'm so sorry for your loss Katherine. He was such a good model and I've enjoyed seeing your sketches of him in your posts. I know you'll miss him! I'm so sorry to hear your news about Cosmo, Katherine. 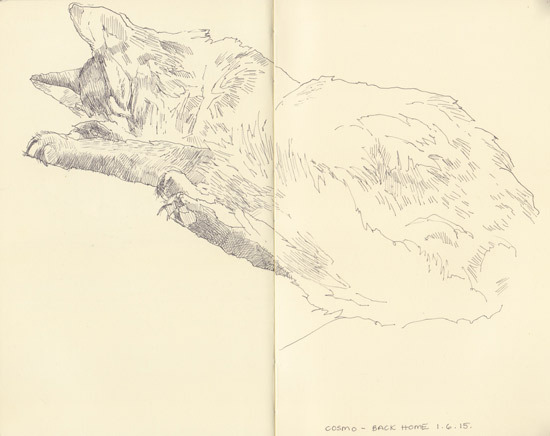 You have so many memories recorded through your drawings - much more personal than photos. It looks like he had a great life with you. I am so sorry to hear of the loss of your beloved Cosmo. I love your sketches and "I spy a spider" drawing of him. Ironically I just returned from the vets to put my cat Norton down due to cancer. No matter the circumstance it is never easy to lose them. My heart hurts for you Katherine. 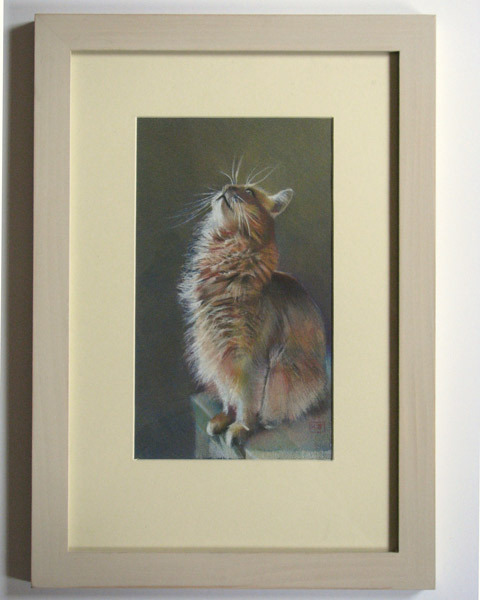 After my cat, Simi, had to be put to sleep I painted her portrait. It was a great way to help my heart heal. My sincere condolences. This is a beautiful tribute to a beautiful boy. What a lovely tribute to Cosmo! So sorry, Katherine. RIP Cosmo. So sorry to hear of your loss. Your drawings are such a beautiful celebration of his life. 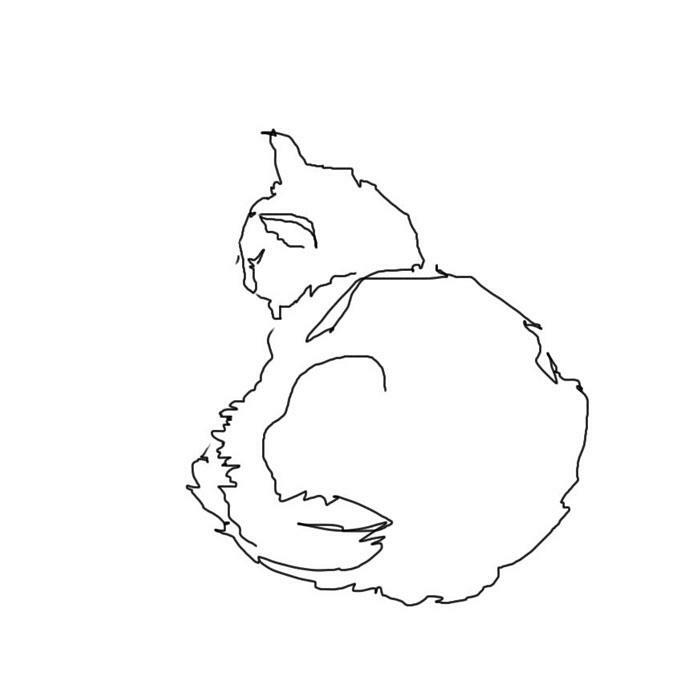 This is always the hardest part of loving cats. You gave him a wonderful life. What wonderful artwork to remember him by. My condolences on his passing. An update to this post about finding a container for his ashes. I found a wonderful duck egg blue heart shaped leather container by Dulwich Design in John Lewis. It had all the features I was looking for: small, rounded, nice to the touch and absolutely totally secure containment of the ashes (it has a zip!) should it accidentally fall on the floor. The bonus was it is also heart shaped - and that made it a dead cert from the moment I laid my eyes on it. I lost my beloved petite long haired white odd eyed cat Liza 2 years ago on Labor Day weekend. She was 17, and there will NEVER be another cat like her. Miss her everyday. I had her cremated, and to my surprise, the ashes were placed in a little wooden box, with a brass plate with her name on it. When she died, I didn't even ask the vet any details about how her ashes would come back....I couldn't even talk at the time, I was so devastated. If I were looking for a box, I'd check out some artisan type jewelry or trinket boxes. Lots of artists making these boxes, places like Etsy.com would be a good place to look. I looked long and hard on Etsy and could find nothing suitable. Do Hobby Artists need to complete Tax Returns?